The natural process of aging can take its toll in a number of ways, including the formation of expression lines, loss of fat volume and bone structure, the force of gravity, and the big one – sun damage. There is no single treatment that addresses all aging skin issues and works for everyone, and often more than one treatment is needed. Anti-aging treatment typically incorporates a combination of cosmetic procedures, including microneedling, stimulation of growth factors, and Intense Pulsed Light (IPL) treatment. This treatment combination induces the body’s own natural healing process and creates a significant reset of the aging process. It can address all signs of skin aging such as lines and wrinkles, sagging skin, eye puffiness, droopy eyelids and much more. While aging is a natural life process that can’t be prevented, healthy lifestyle choices and innovative technology can slow down aging and keep you looking younger and healthier for longer. When it comes to your skin, inner and outer care is essential to maintain a youthful appearance. What you eat has a direct impact on skin health, but if you want to take your skin care regimen a step further, cosmetic dermatology treatments that reduce the signs of aging may be an option. At Vita Cosmetic and Laser Clinic, we offer the most cutting-edge and non-invasive treatments that diminish the signs of aging, restoring the skin’s natural glow and youthful beauty. We’ve assembled some of the most effective treatments that provide excellent results, pain-free. Microneedling is a procedure that uses very fine needles to create tiny punctures in the skin. These small contact points stimulate the body’s natural wound-healing ability and cell renewal process triggering the production of new collagen and elastin and resulting in an almost immediate plumping effect. Microneedling is also an effective treatment for other skin conditions such as scarring, dark spots and sun damage. Microneedling is an excellent treatment for darker skinned individuals, since it doesn’t involve peels or lasers, which can cause increased pigmentation. Microneedling treatments can be performed on the body as well as the face with minimal downtime. For best results, a course of treatments is usually recommended. Platelet Rich Plasma Therapy (PRP) is a non-surgical treatment that uses the platelets from your own blood to stimulate your body’s natural healing abilities. These activated platelets secrete and release at least 7 different growth factors that promote skin regeneration. During a PRP therapy treatment, a small amount of your blood is drawn into a sterile tube in the exact same manner as a standard blood test. The tube is then placed into a centrifuge and spun to separate the plasma and platelets from the other blood components. The production of new collagen induced by the PRP treatment will brighten, rejuvenate and rehydrate the skin even after the first treatment. To experience the full effects of this pioneering. IPL or Intense Pulsed Light is a light-based treatment that is used to treat a variety of skin conditions. IPL treatments, sometimes referred to as “IPL photofacials,” are broad-spectrum light treatments. IPL works the same way as a skin laser, converting light energy to heat to target cells below the skin’s surface without damaging the top layers of skin. IPL uses short blasts of a polychromatic, high-intensity light to penetrate just beneath the skin’s surface, either breaking up the melanin cells that cause brown age spots, or destroying broken capillaries, the small, dilated, non-functional veins medically known as telangiectasia rosacea. IPL treatments also stimulate collagen and elastin production, thus plumping up fine lines and giving your skin an overall healthy glow. IPL treatments can rejuvenate the texture and tone of the skin, to create a younger-looking, refreshed appearance. With the Cynosure® Icon™ IPL, you will see dramatic results without the lengthy downtime associated with an invasive facelift or other, fully ablative laser treatments. This in-office treatment takes less than 30 minutes and provides remarkable results you will be pleased with. 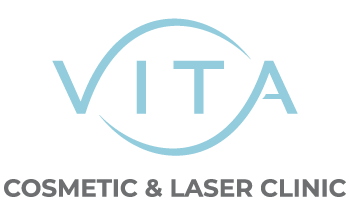 Vita Cosmetic and Laser Clinic offers a wide variety of anti-aging therapies and skin products. For more information about our products and services, please contact us to book a free consultation. Book your Free Confidential Consultation today and speak with one of our anti-aging treatment specialists to discuss whether PRP therapy, ILP Light Treatment, or microneedling is right for you.